No-cook? No kidding. 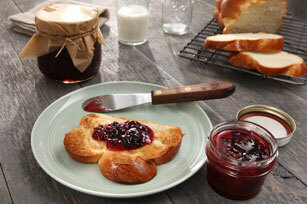 This No-Cook Sweet Cherry Light Jam takes only a few simple steps. Chop, measure and stir your way to a batch of homemade cherry jam. MEASURE prepared cherries into a large bowl. Add lemon juice. MEASURE sugar and set aside. COMBINE fruit pectin crystals with 1/4 cup of the measured sugar. ADD pectin mixture to fruit, mixing well. Let stand for 30 minutes, stirring occasionally. STIR in remaining sugar and continue stirring for 3 minutes until most of the sugar has dissolved. POUR into clean jars or plastic freezer containers. Cover with tight lids and let stand at room temperature until set (may take up to 24 hours). STORE in freezer. If used within 3 weeks, jam may be stored in refrigerator.